As the first round of midterms comes to a close and the second one creeps back up on us, Main Stacks is probably feeling more and more like your home yet again. While Main Stacks can be a magical world where you work so hard that you lose track of time, it can also be miserable. There are far too many things that can go wrong while you’re there. We at the Clog have been there. We’ve lived through the horror. We know the worst things that can happen to you while at the Stacks. Forgetting to put your phone on silent. Heading to Main Stacks can be a little daunting because if you even breathe a little too loud, you’re probably going to get some death stares. Your phone ringing while you’re lost in your books may be the world’s #1 deadliest sin. Plus, thanks to the architects of this beloved library, your ringtone is sure to echo all the way from floor D to the circulation desk. Yikes. Leaving your computer charger back at home — or anything, for that matter. We all know that deep sigh — that misery we feel when we find a spot at a coveted cubicle at Main Stacks and open our backpack to find a dead laptop and a missing charger. Making the trek to Main Stacks for an all-day study session can feel like packing for a week-long trip and going to the airport. Especially because if you forget one thing, especially the most vital item (your computer charger), it’s not going to be all swell and dandy walking all the way back to grab that one thing you forgot. You might as well just forget studying at the library altogether and stay at home. Pulling out your chair only to have it make that shrieking noise. This is by far the most death-stare-worthy moment, as other Main Stacks dwellers expect you to use what little strength you have left over from all those all-nighters to physically lift the chair off the ground and move it back to the appropriate place that allows you to comfortably sit in it. But you don’t, so it sounds like nails on a chalkboard and a cat taking a bath all at the same time. 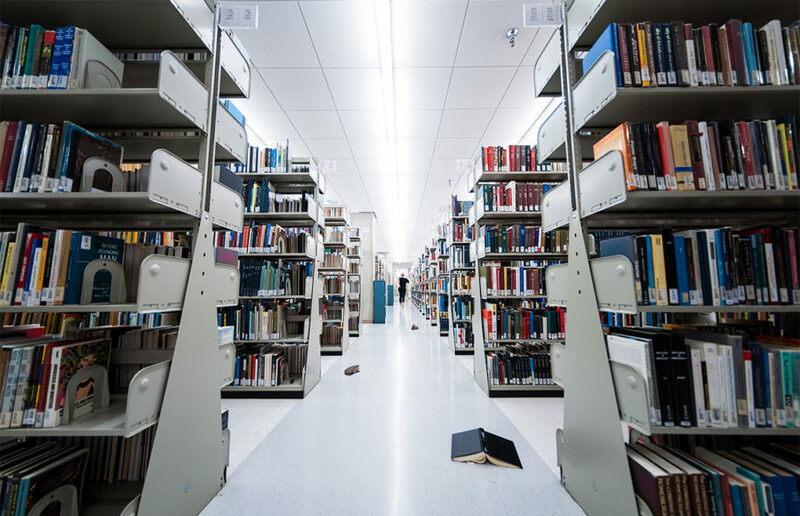 Petition for Main Stacks to please un-squeak its floors and be a little more like the East Asian Library. Getting so lost in the Stacks that you can’t find your way out. We all probably remember the first time we stayed at Main Stacks past 8:30 p.m. and had to somehow find our way out via the maze to Moffit. Sometimes you need to be so focused that you send yourself all the way down to the bottom floor to the most secluded corner of the Stacks, but finding your way out ends up being even more of a challenge than catching up on your work in a timely manner. This one’s kind of obvious, but if you end up in Main Stacks on this particular day and you’re not about seeing everyone’s bits, then we at the Clog are deeply sorry.